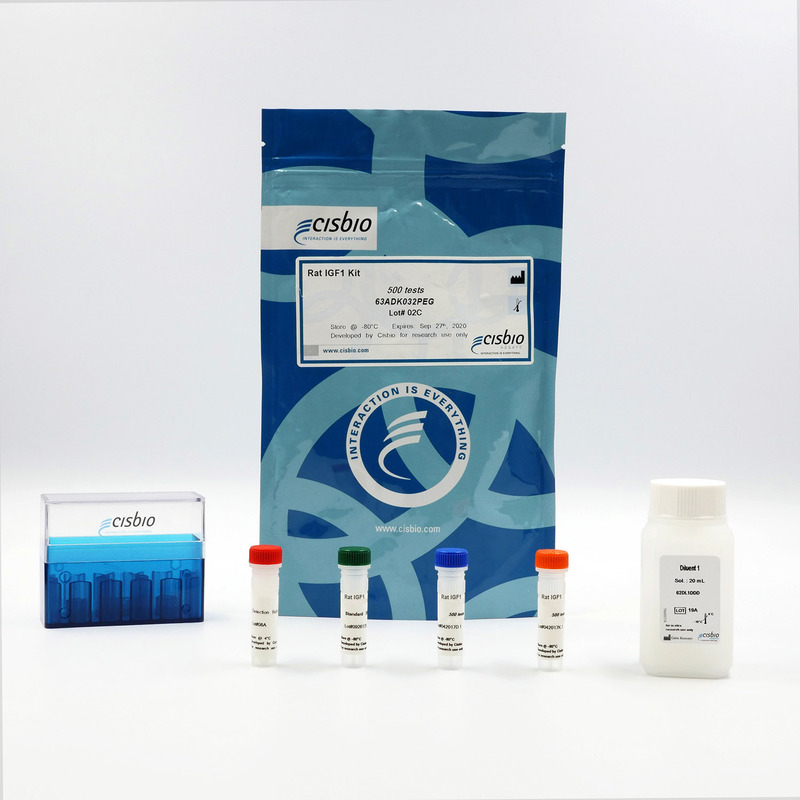 The Rat IGF1 kit is designed for the fast detection of IGF1 in cell supernatant. Insulin-like growth factor 1 (IGF-1), also called somatomedin C, is a primary mediator of the effects of growth hormone (GH). Growth hormone is made in the anterior pituitary gland and is released into the blood stream. It then stimulates the liver to produce IGF-1, which in turn then stimulates systemic body growth and has growth-promoting effects on almost every cell in the body, especially skeletal muscle, cartilage, bone, liver, kidneys, nerves, skin, hematopoietic cells, and lungs. The rat IGF1 kit is designed for a rapid detection of rIGF in cell supernatants. Rat IGF-1 is measured using a sandwich immunoassay with two antibodies specific for rat IGF-1, respectively labelled with Europium Cryptate (donor fluorophore) and d2 (acceptor fluorophore). The intensity of the FRET signal is proportional to the concentration of IGF-1 present in the sample. The rat IGF-1 assay protocol is shown here using a 384-well small volume white plate (20 µL final). Cell supernatant, sample, or standard is dispensed directly into the assay plate for the detection of rat IGF-1 by HTRF reagents. The antibodies labelled with HTRF fluorophores may be pre-mixed and added in a single dispensing step to further streamline the assay procedure. The assay can be run in 96- to 384-well plates by simply resizing each addition volume proportionally.